The portable receiver RDR53 is a freely configurable SW receiver / transceiver with optional UKW / 2 m reception and transceiver operation. Its bright and very large display with touchscreen operation allow for horizontal “Tablet” or vertical operation. The lectern-shaped casing of the device contains an aluminum front panel. The super bright wide-angle WVGA display (800 x 480 pixels) with a size of 8” (200 mm) contains a touch panel for easy operation of the device. An additional rotary encoder in smooth optical or gently resting magnetical execution allows for a fast adjustment of set values. The RDR53 contains the spectrum based RDR technology of the newest generation with full 2.5 Hz resolution. FM module (FM broadcast, extended 2 m range, DAB / DAB+) and various transmitter modules (high quality exciter, polar modulator) can be installed. Rigging a 18 bit high end Quad ADC RAD18 as well as a 24 bit Stereo DAC RDA31 is possible. 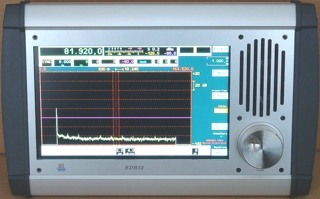 User interface and device functionality of the RDR53 mostly match the ones of the RDR54 and RDR55 devices. The device is still in development. User manual will be available soon.